Looks like this organization has the ability to solve the current situation with jet fugitives into the EU. I personally had the opportunity to speak to the IHRC representative, and amazed me with their hard work and enthusiasm with which they embarked on work. They started to work on the hardest possible project that today is deserting all over Europe. And that is the rescue and help of the migrant coming from Africa. coast of the African continent and to provide them, deserving of time for examining each applicant's asylum option . The IHRC is duly registered in the UN. Currently awaiting registration in the Czech Republic. There is talk of a clear solution, the refugee crisis, and it will certainly be the first interest of the government of the Italian Republic. The same will be of interest to the Prime Minister of the Czech Republic. Because this organization is applying for registration in the Czech Republic, all the benefits would be transferred to that country. Mr. Prime Minister will be also happy. IHRC has a solution and a likely deal with the coastal state on the African continent about the placement of refugees. We wish the IHRC and all of its team to succeed in the shortest possible time. One of the most important principles of work IHRC is impartiality and independence. 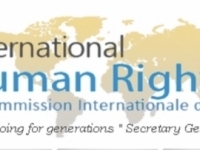 International Human Rights Commission painstakingly observes its aim for defending human rights not to become an instrument for political, economic or military interests. Particularly in conflict areas it attaches great value to asserting its independence from all parties involved. The nature and scope of the assistance are adjusted to the situation in the disaster zone within the framework of available possibilities. Aid measures are designed to suit the local conditions and are integrated in the economic, social and political context of a specific country or region. They are adjusted to respond to the needs and the situation of the victims, respect the dignity of the people, and protect valid laws and traditions. Aid commodities are deployed according to need and correspond to local standards. They are purchased locally so far as it is possible and useful.